nice one! a bit slow.. but great anyway.. i thought was a joke of the melon demo.. impressive! 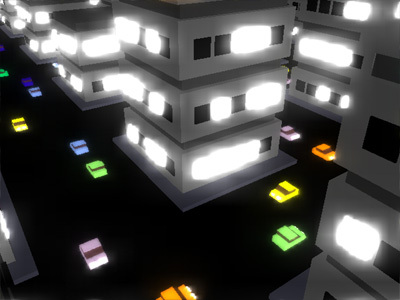 There was a bug in the previous release, there was supposed to be lampposts in the streets. Now it's fixed. The fuzzion frog is back! Ruled at the bigscreen. Yep, the frog theme might be repetitive for some people, but I still like it ;). gargaj & ps, if the party version doesn't work in your computer, try to update your windows. It needs almost all windows updates. There will be a compatible version when we release the final version. fuzzion frog strikes again! very funny. tolemac, you have discovered us.. it's the new win32 polymorfic virus: "frogzilla". gargaj, please mail me details about your computer... and double check if you have all the patches. Hahaha :D A bit slow on my gf2mx/1,1ghz Athlon but great for a 4k anyway. blala, the final version is getting closer please be patient. Nice and funny! Another frog adventure by the fuzzion crew. Are you planning to port to d3d 9? Can you optimize a little more the glow effect, or there's room for any more byte? Thought about implementing a little rigid body plugin 4 the frog series? jak, we'll try to fix various things in the final version, please wait for it. Will not work, Crashes after 1 second. Demo-Craze: Maybe you don't have enough space in your hd to unpack the intro. :) Which OS do you have? Have you installed all the windows patches and service packs? nice work, MORE FROG 4ks PLEASE (i want to see that cute orange frog again!) !!! The screenshot is cool. Incompatibility with ATI cards is not. Utopian, we are working on the final version which will be more compatible. new file uploaded with compatible versions which doesn't require the windows patches. The main reason of the low framerate is the enormous number of polygons that the city has. The geometry and animation for each building is code-generated trying to keep the code as small as possible, instead of creating an optimal vertexs / polygons count. And DLOD didn't fit in also. The same applies for the cars. Finally, you have to render the city twice to get the nice glow effect and this really hurts. We are trying to make this move faster, but the problem is fit it in 4k :P.
To obtain glow it is *not* required to render it twice. I only would like to point that we don't use offscreen buffers, too many calls in OGL for a 4k. The (maybe lame) glow we use is based on hardware automatic mipmap generation, which is quite fast and small in size, but it is fucked on ATI drivers. I don't want to discuss which method looks better or is faster, I never had the intention to make "the ultimate glow in 4k"
...we don't use offscreen buffers, too many calls in OGL for a 4k. Damn straight.. It's probably not "too many calls" and even if it was, you'd be using the wrong tool for the job (read; OGL). But I sincerely doubt that. blala: when I said we don't use offscreen buffers I was talking about pbuffers. rulez added on the 2004-09-09 16:05:50 by AbcuG! pretty cool! fuzzion for president! Just my vote. Greetings to "La Rana Apocaliptica"
Now thats what I call a nice 4k. Totally cool. page created in 0.027847 seconds with 15 queries.